Italy coach Cesare Prandelli will be looking for his side to extend their proud record of never losing to Germany in a major finals when they meet in tomorrow's Euro 2012 semi-final in Warsaw. Joachim Loew-coached Germany - who are seeking their first trophy since lifting the Euro '96 title - will be by contrast hoping to end that run in what is their eighth meeting at either a World Cup or a European championship finals. Germany are sweating over the fitness of Bastian Schweinsteiger, who has been key to their campaign at the European Championships. Italy striker Mario Balotelli has landed in another race row after an Italian newspaper depicted him as King Kong in a deeply offensive cartoon in a photo-illustration. "Mario is such an important person in Italian football. Aspiring players in Italy who want to follow in his footsteps could wonder what support they will have when they get to his level when they see cartoons like that," a spokesman for the anti-racism organisation Kick It Out said. The All India Tennis Association (AITA) has claimed that its “goodwill with the ITF (International Tennis Federation)” had some role to play in the “wonderful achievement” of getting three wild cards for Sania Mirza, Rushmi Chakravarthi and Somdev Devvarman. 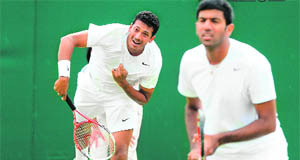 Mahesh Bhupathi and Rohan Bopanna, whose insistence on pairing at the London Olympics touched off a recent storm in Indian tennis, today advanced to the second round of the men's doubles event with a straight-set victory at Wimbledon here. Andrea Pirlo will once again look to mastermind an Italian win, as his team look to keep their record of never losing to Germany at a major tournament intact. "There is no such thing as an invincible side," said Prandelli. "Germany has that sense of knowing what they need to do. They are also physically strong and have players who have tasted international success at club level, so they are a side with the ingredients to go all the way. "But we will study them closely and work on the few weak points they have." Italy needed a penalty shoot-out to beat England 4-2 in Sunday's quarter-final in Kiev with the Azzurri failing to hit the net in normal play despite 68 percent ball possession and 35 shots compared to England's nine. Prandelli has said the Italians will have to be daring in order to beat Germany, who are on a 15-match winning run in competitive matches since losing to Spain at the last World Cup. Germany's forwards shone in Friday's 4-2 quarter-final win over Greece and Prandelli is mindful of the risk of pushing too far forward against a German side with the pace to punish on the counter-attack. Manchester City's Mario Balotelli is one player the Germans have admitted they will pay close attention to after he spearheaded an Italian attack which had periods of impressive form against the Three Lions. With only a three-day turn-around between the quarter and semi, Prandelli has injury concerns over midfielder Daniele De Rossi and right-back Ignazio Abate, while Italy's other right-back Christian Maggio is suspended. Aside from a 1-1 draw in a friendly in February 2011, the last time the teams met in competition was the 2006 World Cup semi-final when the Italians won 2-0 after extra time as they went on to win the title. But coach Loew was defiant when asked about the lack of German success against the Azzurri over the years. “We can't turn back time, forget about about it, the past doesn't play a role in our planning," said the 52-year-old. "Another stat is that Germany has never won against Italy in a major tournament, but so what? "The situation is entirely different now and this is not an issue for us." But Italian playmaker Andrea Pirlo believes the Germans are running scared and the 33-year-old believes that history will give Italy the edge. "Germany are definitely scared of us, they know we can create difficulties for them given what's happened in the past and they will have to be careful to avoid a repeat of what happened in 2006," said the Juventus midfielder. Germany have dominated all of their games at Euro 2012. And the reason is down to their technical brilliance. Khedira, Schweinsteiger and Ozil are big names and they have shown their worth in a 4-2-3-1 formation. Germany have won a record 15 successive competitive games, breaking the 14-match international record previously held by Spain (2010-11), Netherlands (2008-10) and France (2002-04). Die Mannschaft have never beaten Italy in a competitive fixture. Their record in seven head-to-head meetings in major tournaments is D4, L3. Three-time champions Germany have won all but one of their six European Championship semi-finals. Joachim Low's side have scored at least once in each of their last 20 games. Germany are 2.33 to win the game on the Asian handicap 0.75 with SBOBET. Italy have won just one of their last seven matches in regulation time. The Azzurri are meeting Germany for the 31st time, with their record in previous encounters reading W14, D9, L7. They have not lost to the Germans since a 2-0 friendly defeat in June 1995. Italy are yet to lose a competitive game under Cesare Prandelli, recording nine wins and five draws to date. Andrea Pirlo attempted 146 passes in the quarter-final against England, completing 117 - the most by any player at Euro 2012, extra-time included. 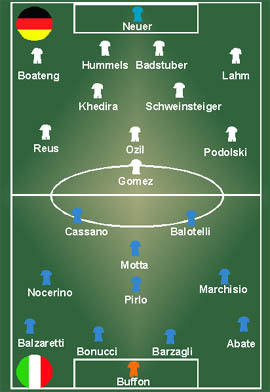 Italy are trying to find their flow, and the 4-3-1-2 formation has worked well for them till now. A big question might be whether to stick to the tempramental Balotelli or bring in the veteran Di Natale, alongside Cassano. "It is not the first time we have seen this sort of depiction of Mario and we think the media have a responsibility. How do they think they can portray him like that?" he added. Prior to Italy's clash with England in the Euro 2012 quarterfinal match, Gazzetta dello Sport published a drawing of a giant Balotelli atop Big Ben swatting away footballs, in the same way King Kong did aircrafts atop New York's Empire State Building in the film. The cartoon outraged the Balotelli camp while Gazzetta have issued an apology. "It wasn't our cartoonist's best product. In these times we need a bit more moderation, caution and good taste. But we have always fought against racism and condemned booing against Balotelli as unacceptable," the Daily Mail quoted the Milan-based newspaper, as saying. Oza said the AITA applied for wild cards for Sania (both in singles and doubles), Rushmi and Somdev, as Sania would not have been able to play in the mixed doubles without a wild card. “With a combined ranking of 19, they (Sania and Leander) were placed 9th among the top 12 teams, to be eligible for mixed doubles, and this selection is purely on merit,” Oza added. He said the AITA added Rohan Bopanna (ATP ranking 12) and Mahesh Bhupathi (ranking 14) as the second doubles team, based on their combined ranking of 26. He said the final decision of the AITA has been conveyed to the Indian Olympic Association. The AITA has appealed to all the players to “unite together, shed off all their differences, stop going public (with their opinions) and join hands together in the best national interest of winning medals for the country and to bring glory to the nation”. The seventh-seeded Indian combination got the better of Marcel Felder of Uruguay and Tunisia's Malek Jaziri 6-0 7-6 (1) 6-2 in an hour and 36 minutes at the All England Club here. The duo will take on the winner of the match between Russia's Mikhail Elgin and Uzbekistan's Denis Istomin and Spaniards Pablo Andujar and Guillermo Garcia-Lopezin in the second round. Bhupathi and Bopanna converted five of the nine break points they got, while their rivals failed to convert any of the five opportunities that came their way. The Indians also won as many as 101 points as opposed to just 66 won by their unseeded opponents. Dominating from the word go, the Indian duo took just 17 minutes to wrap up the first set after converting three of the four breakpoint chances. However, Felder and Jaziri managed to take the second set to the tie-breaker, even as Bhupathi and Bopanna double faulted thrice, besides making three unforced errors. Swiss Roger Federer, bidding for a record-equalling seventh men's singles title at the All England Club, outclassed Fabio Fognini 6-1, 6-3, 6-2, displaying his full repertoire of shots in front of an appreciative Royal Box. KOLKATA: I-League side Prayag United Sports Club has roped in Costa Rican international footballer Carlos Hernandez for a one-year contract in a bid to strengthen the team for the next season. Hernandez, an attacking midfielder, has been an important member of the Costa Rica national football team at various levels, playing in the U-20 World Youth Championship in Argentina.